How I got this book: Borrowed it from the library. Why I read this book: I was playing tennis with a friend when she recommended it to me. She said she felt like she was trapped in the opening story. You might understand my reluctance to go on with the anecdote if you've read the story in question. 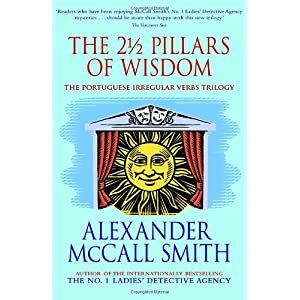 The 2 1/2 Pillars of Wisdom consists of a trilogy of comic short novels – Portuguese Irregular Verbs, The Finer Points of Sausage Dogs, and At the Villa of Reduced Circumstances – featuring the bungling German professor of Romance Philology Moritz-Maria von Igelfeld, his duo of equally bungling friends, and a cast of characters who either join in with the bungling or end up victims of it. This is the first I’ve read of the intimidatingly prolific Alexander McCall Smith (How does the man sleep? ), and having read these stories – for this trilogy is really a volume of short stories rather than three full-length novels – I must say that I’m very keen to delve into some of his more well-known series. It probably ought to be mentioned that, on a very basic and obvious level, the humour of these stories is often derived from the heavy use of stereotypes. The Italians are boisterous and tend to gesticulate wildly; the Irish drink a lot; the Indians are either psychic holy men or casual law-breakers; the English are alarmingly eccentric; the Colombians are obsessed with bringing about the revolution; and, of course, the Germans are proper, logical and utterly horrified by lack of decorum. Additionally, with the stereotype of bumbling brainbox professors being played out for laughs, there is a strong element of Schadenfreude, as it were. Basically, we’re encouraged to laugh at poor von Igelfeld as he traps himself in corners with his ineptitude. Despite all that has been said, however, none of this stereotyping is overtly mocking or mean-spirited in the least. Trust me on this one: I’m the sort of person who can’t watch The Office because it gives me such a serious case of second-hand embarrassment that I want to defenestrate myself on the characters’ behalves. If it gets too sneery, my overdeveloped embarrassment gland means that I will avoid it like the plague. That said, as a student, I've been in contact with academics for the better part of two years now, and part of the reason these stories are as charming as they are is that they genuinely manage to capture some truth in the whimsically awkward situations described. Trust me on this one, too: I’ve witnessed situations involving professors that were so horrifically awkward I wanted to defenestrate myself on their behalves... Yet somehow, these events have been unbelievably hilarious in retrospect – and these stories are perfectly spot-on in evoking that sensation. I’d recommend this to anyone looking for a light, humorous read. In fact, I’d also recommend that anybody who thinks they may get stranded on an island anytime soon slip a copy of this into a water-tight bag and carry it around on their person. This is the sort of read whose gentle frivolities you can easily lose yourself in – even when stranded on an island with no food, no water, and no hope of rescue. Yes, The 2 1/2 Pillars of Wisdom may just have become one of my Desert Island Books, and it gets 5 stars from me. This sounds like it would be really funny! I'm in need of that kind of book I think! Great review..I love the way you write!